After 6 weeks without rain, it was with some trepidation that I went to check on the fruit trees on Jubilee field (by the Sports Centre.) We had pruned the trees in the spring and I had thinned the fruit quite a lot in June as most of the trees had set a lot of apples or pears. At that stage it looked as if it would be an excellent crop. Now though, the lack of water was having an effect. At least three of the apple trees have many leaves with brown edges, and the apples are very small. I watered every tree thoroughly, and also gave them a dose of Tomorite to encourage the fruit to grow. But, basically, we are dependent on some really heavy and prolonged rain to have any real effect. On a more optimistic note, several apple trees, the pears and the quince are doing well, and the plum tree we planted in the spring seems to be surviving the drought. Late Spring 2018 – what is happening on the ALFI plots and planters? After a cold, wet spring, I was feeling frustrated at how difficult it was to get started on the vegetable-growing season. We had sown beans and parsnip seeds, and almost none had germinated, and planted out carrot, beetroot and spinach seedlings in April only to find wind and cold temperatures almost killed them. Although there was plenty of apple blossom on the trees at Jubilee Field, it was hard to believe there were many flying insects to pollinate them. But a few weeks later, after some gloriously warm, sunny days, with intermittent rain showers, things are looking much more encouraging. At the Westbrooke plot, the runner beans have started running (up the bean poles) and the sweet peas are suddenly following their example. The broad beans are forming pods, a row of peas and a row of parsnips have germinated quickly now the soil is warm, and carrot, spinach and beetroot seedlings have recovered from the cold shock and are doing well. Lettuces and rocket are coming on too. And a row of tiny leeks are getting established. The Allen Gallery raised beds have filled out, with their interesting variety of herbs and perennial vegetables enjoying more light and sunshine after some of the overhanging trees have been cut back. And other planters around the town are all looking good, with their herbs and insect-friendly flowers. On the Jubilee Field most of the trees have set lot of little apples or pears and we can hope for a good crop of fruit in a few months. The Vicarage plot, full of soft fruit bushes and strawberries, is flourishing and we shall soon be planning a rota of people to pick the berries to put out on the wall at the front of the garden. The Station plot is full of promise too; come and see it on Monday July 2nd, at 7.00pm, before our short and sociable AGM at the Railway Arms at 7.30pm. ALFI first started to cultivate the Westbrooke plot (a roadside verge at the junction of Lenten St and Westbrooke Rd) as a small vegetable and herb garden in 2009. For the first two or three years it was pleasingly productive; presumably the soil was fertile after growing only mown grass for many years. But gradually the productivity decreased. One problem was the lack of a water supply. At first kind neighbours let us get water in cans from their taps but we were grateful when ATC agreed to fill our water butts on a weekly basis through the summer. We now have two butts, and organise a watering rota through the summer months. The site is also quite shaded and on a slight north-facing slope so crops only get sunshine from mid-day onwards. However, the biggest problem was that whenever we dug over the plot, we found that masses of tangled fibrous roots had grown in from a large sycamore tree in a nearby garden. These, presumably, were taking water and nutrients from our crops. We had two lovely raised beds constructed and filled them with good soil and organic material over a permeable plastic sheet at ground level. I was sure this would prevent the roots from growing up. I was wrong. The more we fed the plants, the more the roots grew in! So last year we decided to dig out the smaller raised bed and laid an impermeable plastic sheet before refilling with a lovely mix of fertile soil. And this year that bed has been most rewarding. Broad beans, peas, salad crops, beetroot and carrots have all done well through the summer, and in late September we planted seedlings of spinach, rocket, radish and Chinese cabbage – all of which have flourished and are now ready to pick. So we have just had a working party to dig out the bigger raised bed to lay an impermeable membrane in that one too. Hard work; it is amazing how much soil comes out of a modest raised bed. But a good team of volunteers completed the task and the bed now has a few months to settle before we start planting again, beginning with broad beans in February. Finding solutions to such problems is what makes gardening so satisfying. Unfortunately the rest of the plot still has to compete with the tree roots so we have to grow hardier, less hungry plants there-like herbs-unless we can find another solution! ALFI joined a number of charities in the lovely Allen Gallery garden, with a table with a tombola, and a cress-growing activity for children as well as our display boards and newsletters to publicise our events and activities. It was a hot, sunny day as a number of people came to see what we do and to support our efforts. The profits from the tombola, which sported a number of gardening related prizes, will go towards expenses for our plots and planters, and educational schemes such as our annual schools competition. ALFI maintains a herb bed in the Allen gallery garden, and next door is our fabulous Vicarage plot, which has yielded a staggering amount of fruit this year, regularly picked and put out for public collection by our volunteers. 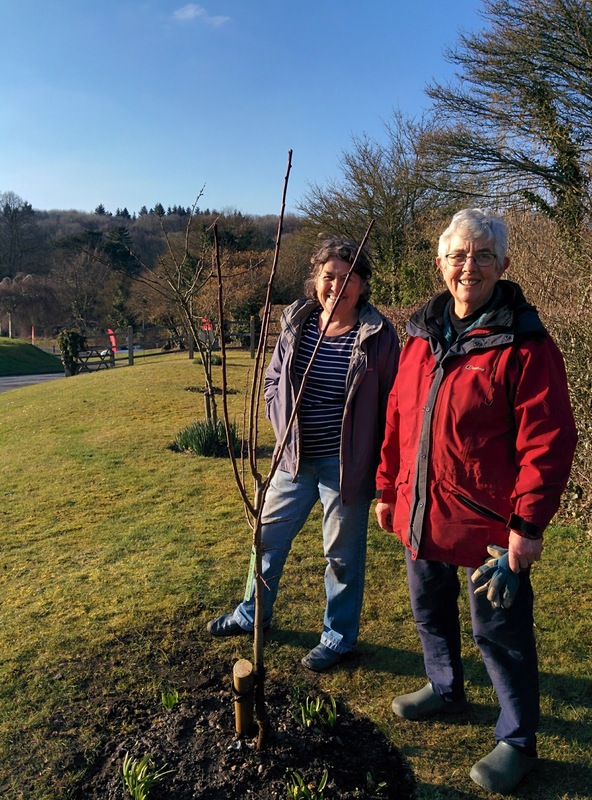 Elsewhere, two of our apple trees down at Jubilee Fields (between the Sports Centre and the playing fields) are bearing fruit that should be ready to pick in September or October. The trees in our orchard are only young, and their yield will pick up over the next few years, and, with a little care and attention, they will fruit for decades to come. Did you know that the original “Bramley’s Seedling” apple tree, from which the famous cooking apple originates, is now more than 200 years old? Orchards, as well as being wonderful for us, are also great for wild-life, supporting many invertebrates, pollinators and birds. We’ll enjoy watching it grow! Our next event will be our annual Harvest Feast on October 9th in the Methodist Church Hall in Alton, from 11.00am. The Community Orchard has an encouraging crop of apples this year. Look out for signs on the trees indicating when apples are ready to be picked – and please pick sparingly so that there are some fruit left for other people.